Let me start this post by stating that George W. Bush was a bigger spender than Barack Obama (though the numbers are somewhat distorted by TARP, which caused a big increase in the burden of spending during Bush’s last fiscal year and artificially dampened outlays in Obama’s first fiscal year since repayments from the banks counted as negative spending). So I’m not trying to make a partisan point by sharing these cartoons. I don’t like it when Democrats increase the burden of government spending and I’m equally dismayed when Republicans engage in same type of profligacy. 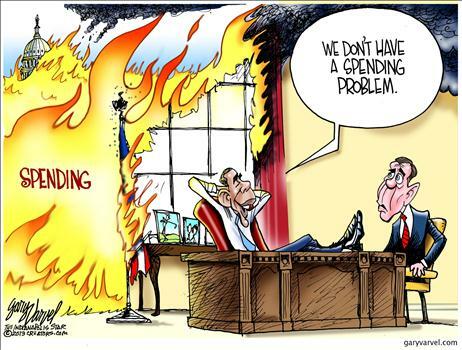 That being said, I was a big dumbfounded when President Obama recently claimed that there’s not a spending problem in Washington. We know that the United States has a huge long-run problem with deficits and debt according to both the Bank for International Settlements and the Organization for Economic Cooperation and Development. We also know that tax revenues, measured as a share of GDP, will soon be above their post-World War II average and that the tax burden is expected to increase in coming decades. 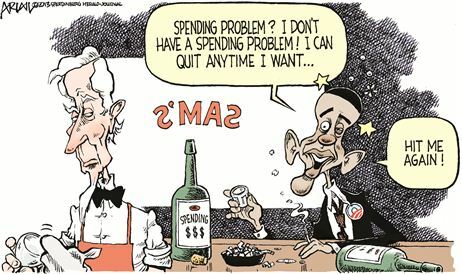 So a person would have to be in serious denial to claim that spending isn’t a problem. Which is the point Eric Allie makes in this cartoon. And the point Robert Ariail makes in this cartoon. 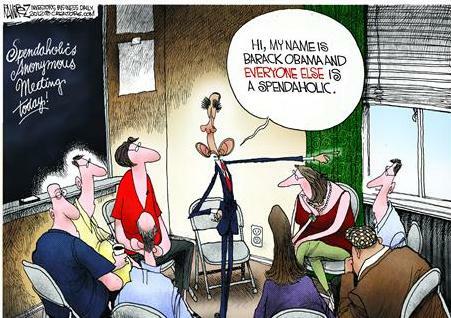 Last but not least, the great Michael Ramirez. Gee, it’s almost like we’re seeing a pattern. And if you like this spendaholic-in-denial theme, you can click here and here for further amusement. P.S. Oh, by the way, if anybody’s actually interested in how to solve the spending problem (you know, the one that doesn’t exist), we do know the answer. P.P.S. 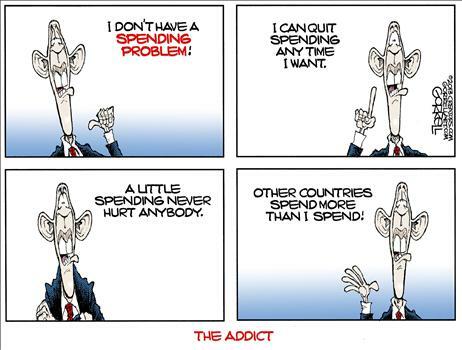 Remember when Obama claimed the private sector was doing fine? 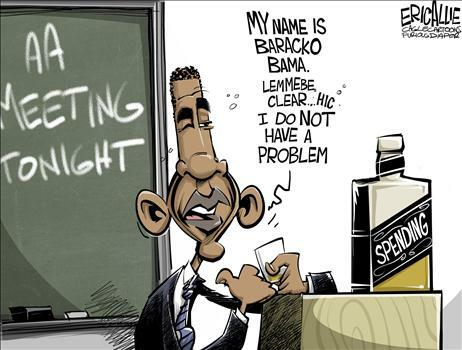 Well, here’s how cartoonists mocked him for that absurd comment. Economists may not agree on much, but we all agree that economic output is a function of capital and labor. Ask a Keynesian, a Marxist, an Austrian, a monetarist, or any economist, and they’ll all agree that living standards are determined by the quality and quantity of these two factors of production. 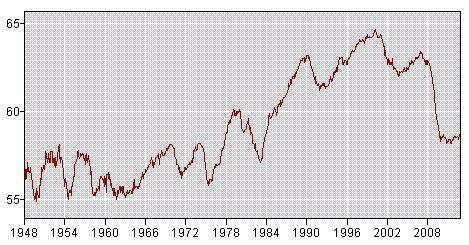 So it should be very worrisome that there has been a big drop in the share of the population that is employed. Here’s a chart produced from Bureau of Labor Statistics data, showing labor force participation during the 21st Century. There was a big drop during the recession. That’s the usual pattern, and it definitely isn’t something that can be blamed on President Obama since the downturn began before he took office. But what is unusual is that the employment/population ratio has not bounced back. As you can see from this second chart, taken directly from the BLS website, there’s normally a “V” pattern. The numbers drop during a recession but then quickly bounce back. That hasn’t happened during this “recovery,” and that’s something that can be blamed on the President’s policies. 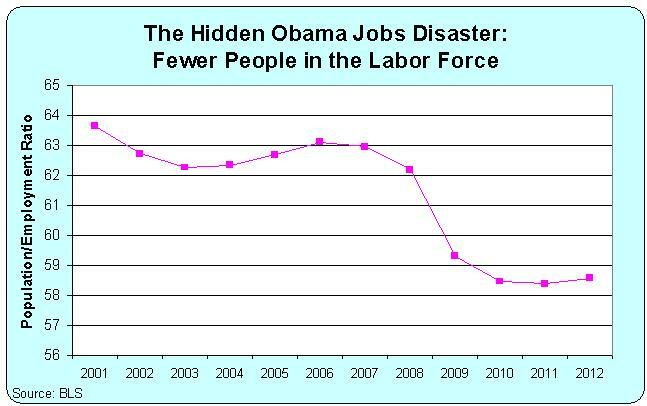 Millions of jobs have vanished. But most of these lost jobs don’t even show up in the official unemployment rate data because workers have left the labor force. Why have so many jobs – and so many workers – disappeared? Writing in today’s Wall Street Journal, Richard Vedder has a very compelling explanation. The national income accounts suggest that about 70% of U.S. output is attributable to the labor of human beings. Yet there has been a decline in the proportion of working-age Americans who are employed. …The decline matters more than you may suppose. If today the country had the same proportion of persons of working age employed as it did in 2000, the U.S. would have almost 14 million more people contributing to the economy. …Why are Americans working less? While there are a number of factors, the phenomenon is due mainly to a variety of public policies that have reduced the incentives to be employed. Richard lists several ways in which government undermines the incentive for work, starting with food stamps. If the government provides food, then the imperative to work is severely reduced. Since the food-stamp program’s beginning in the 1960s, it has grown considerably, but especially so in the 21st century: There are over 30 million more Americans receiving food stamps today than in 2000. He then identifies Social Security disability payments. Barely three million Americans received work-related disability checks from Social Security in 1990, a number that had changed only modestly in the preceding decade or two. Since then, the number of people drawing disability checks has soared, passing five million by 2000, 6.5 million by 2005, and rising to nearly 8.6 million today. In a series of papers, David Autor of MIT has shown that the disability program is ineffective, inefficient, and growing at an unsustainable rate. And he mentions unemployment insurance benefits as well. …the traditional 26-week benefit has been continuously extended over the past four years—many persons out of work a year or more are still receiving benefits. True enough, the economy isn’t growing very much. But if you pay people to stay at home, many will do so rather than seek employment or accept jobs where the pay doesn’t meet their expectations. Richard doesn’t include any specific estimates for the job losses caused by these forms of intervention, or for the other policies mentioned in his column that also encourage unemployment. But there is a lot of data on the negative impact of unemployment insurance payments, and it’s obviously a damning indictment of Obama’s track record that the number of people signing up for disability payments has exceeded the number of jobs created during his tenure. Which brings us to the moral of the story. As the burden of government spending increases, this creates an ever-growing incentive for more and more people to figure out ways of riding in the wagon while simultaneously imposing higher and higher costs on those pulling the wagon. As we see in Greece, that formula doesn’t end well. P.S. Since I’ve mentioned Greece and disability payments, I can’t resist noting that the United States may give disability payments to adults who want to wear diapers as a lifestyle choice, but at least we don’t reward pedophiles with disability payments. In the contest for the most abusive waste of tax dollars, Greece wins.